The healthcare marketing funnel is upside down. 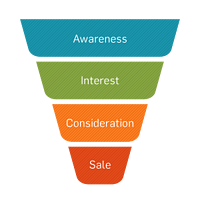 The funnel is a well-known, tried and true concept in B2B marketing. A search for "B2B marketing funnel" returns 20,000+ Google results. The same search for “healthcare marketing funnel” gets 2 results (soon to be 3 with this blog post!). It begs the question: is a concept that’s such a staple of B2B marketing not applicable to healthcare? Or have we just been looking at it the wrong way? In B2B, the funnel orients our thinking. It helps us segment audiences, define content strategies, and allocate marketing resources. Prospects at the top, widest part of the funnel are targeted with high-volume campaigns to raise general awareness. Opportunities at the bottom, narrow part of the funnel receive a more high-touch approach from sales. The goal is to get as many people as possible to realize their pain and move them to “consideration” of your solution. In healthcare, we see a similar approach in practice. Marketing is aimed at moving patients towards treatment. Hospital marketers organize their websites by departments and services, craft campaigns to attract prospective patients, and measure success by the number of online appointment requests received. Having seen the funnel provide such a valuable framework to B2B marketers over the past decade, I thought we could see how it might apply to healthcare marketing strategy. 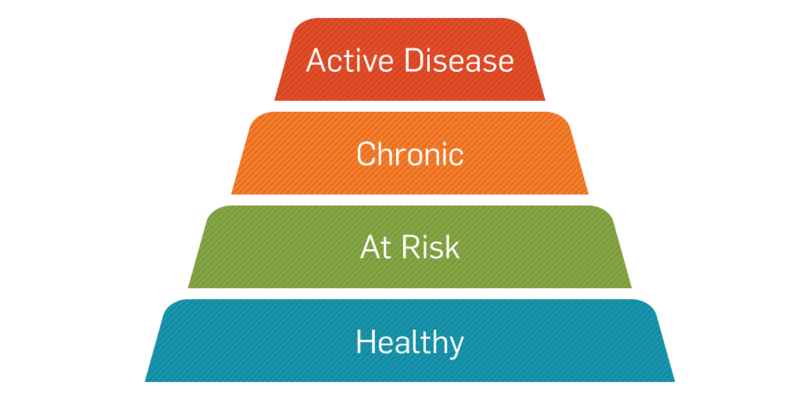 Instead of awareness, interest, consideration, and sale, we’ll pull a little inspiration from leaders in population health management – where the entire goal is to keep patients healthy and out of the hospital. 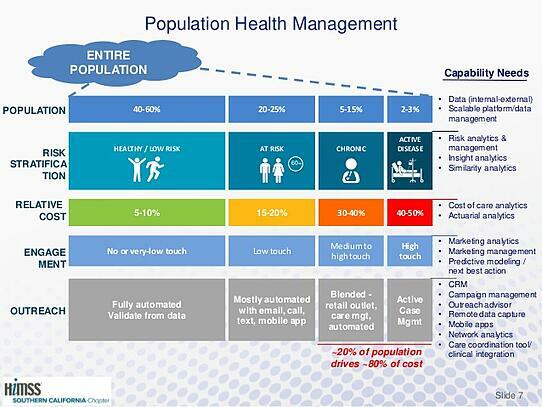 In the below framework presented by IBM at HIMSS 2016, a hospital’s population is broken into 4 categories: from healthy to active disease – each with varying levels of cost, engagement, and suggested forms of outreach. Add this same concept to our model and it's starting to look more like a healthcare marketing funnel. But something still feels a little off. With an increasing emphasis on value-based and accountable care models, the idea of filtering healthy patients towards sickness seems backwards. In order for the healthcare marketing funnel to provide the same valuable framework we see in B2B, we need to re-orient our thinking. A simple flip and we start to see real applications for healthcare. The end-goal of this new funnel is not to make healthy people sick but, instead, to move everyone towards the bottom, healthy base of the funnel. Just like in B2B, the smallest layer of the funnel should receive a high-touch approach (e.g. department-level marketing campaigns) that quickly drive them to a solution – this is where many healthcare marketers focus today. This new healthcare marketing funnel also reveals an untapped opportunity to nurture the healthy base – and keep them that way. Because, as IBM shows, the 20% of people in the “active disease” stage account for 80% of the cost of healthcare delivery. By building low-cost but high-volume campaigns targeted at the healthy, healthcare marketers can reduce the number of high-dollar patients in the “active disease” stage and, as a result, lower overall healthcare delivery costs. What CEO wouldn’t want to hear that from his CMO? What does marketing to the healthy base look like? For inspiration, we turn again to leading B2B marketers. In return for all this valuable content, your audience is happy to offer up an email address that allows you to stay in touch with and nurture them through automated email drip campaigns. This go-to-strategy for B2B marketers is also extremely affordable. In fact, inbound content marketing generates 3x the number of B2B sales leads at 62% less cost than traditional advertising. To learn more about how best practices in B2B inbound marketing can be applied in healthcare, join our April 7 Webcast, “Advertising without the Ads,” including guest Celia Brown, Senior Director of Marketing & Content Strategy at SAP – a B2B company ranking among the top 25 most valuable global brands. We’ll share real world examples of inbound marketing success and discuss their practical applications within the healthcare marketing funnel.